Monday, February 10, 1908 -- a new play debuts at the Burbank Theatre, a melodrama named "Home Folks". The critic is less than impressed, but admits that the audience was delighted with the production. Tuesday, February 11 1908 -- Tonight is the fourth ring meeting of Jack Twin and Jim Flynn. Who will win? Oh, the excitement is palpable. But you'll not know until next week's Herriman Saturday. Lay yer bets! About his art training and early career, Taos and Santa Fe Painters said, "Having shown artistic promise as a boy, Forsythe studied at the Los Angeles School of Art and Design. In 1904 he took the train to New York to study at the Art Students League under Frank DuMond. He worked as a staff artist for Joseph Pulitzer's New York World while attending classes, and later switched to W.R. Hearst's New York Journal…." According to the 1910 census, Forsythe had been married three years. He and Cotta lived in Manhattan, New York City at 640 West 139th Street. His occupation was artist in the business service industry. One of his World strips was I'm Falling in Love with Some One. Taos and Santa Fe Painters said, "…He went on to work for a succession of Hearst papers, drawing briefly for the St. Louis Post Dispatch, and then the Los Angeles Examiner, before returning to New York in the nineteen-teens to work at the American. 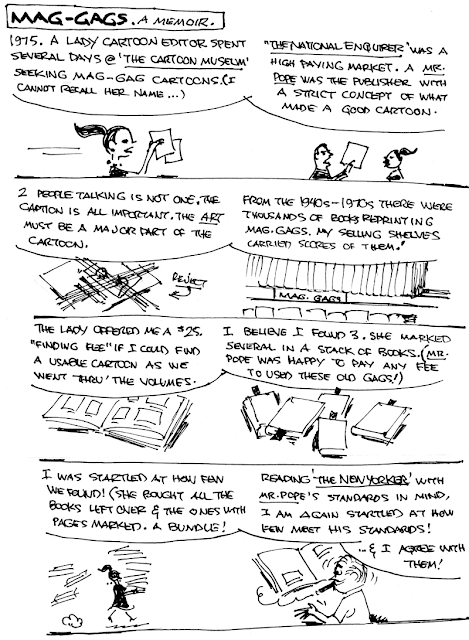 While at the New York American, Forsythe began to develop comic strips. 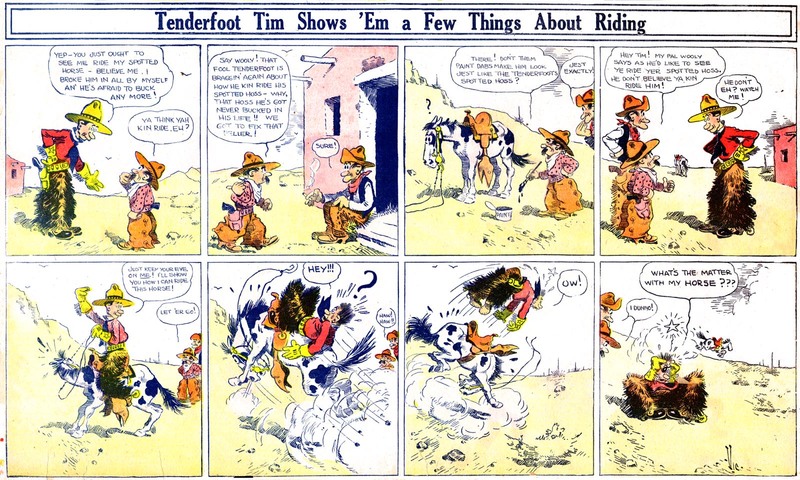 Among his earliest were a gag strip about boxing called The Great White Dope, and a western series, Tenderfoot Tim. In 1918 he began his most successful strip, Joe's Car [renamed Joe Jinks in 1928]…Living in New Rochelle, New York, Forsythe met a young artist named Norman Rockwell, and the two shared a studio that had once been owned by Frederick Remington." His World War I draft card was signed on September 12, 1918. He lived in New Rochelle, New York at 144 Meadow Lane. He was an artist–cartoonist at the Press Publishing Company, located at 63 Park Row, New York, New York. His description was tall and slender with blue eyes and brown hair. In the 1920 census, the couple lived in New Rochelle at 154 Meadow Lane, where he was an artist and illustrator. According to Taos and Santa Fe Painters, "In 1920, Forsythe and his wife, Cotta, had given up New York and returned to southern California.…Forsythe quit Joe Jinks in 1933 and began a cowboy strip titled Way Out West. He then added a home life strip, The Little Woman. Neither of these was very successful, and he returned to drawing Joe Jinks in 1937, but quit cartooning for good the next year." He has not been found in the 1930 census. Victor Clyde Forsythe of 1690 Ramiro Rd., San Marino passed away May 24, 1962. He was a native of Orange, California and had resided in San Marino for the past 20 years. Mr. Forsythe was a member of the Los Angeles Art Association, California Art Club, Salmagundi Club of New York City, Allied Artists of America, Pasadena Art Museum, Pasadena Society of Artists, American Institute of Fine Arts, Rancheros Visitadores and the San Gabriel Country Club. Survived by his wife Cotta Owen Forsythe and one nephew, Thomas R. Gay of Encino. Funeral services Monday at 11 a.m. in the chapel of Pierce Bros. Fred A. Turner, Alhambra, mortuary, Rev. Raymond [illegible] Richs officiating. Interment, private. In lieu of flowers friends may contribute to the Orthopaedic Hospital or their favorite charity. 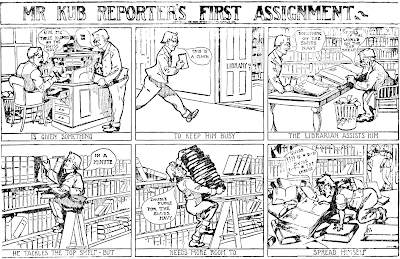 Vic Forsythe was doing great as one of the more prolific cartoonists on the staff of Pulitzer's New York Evening World when, in 1913, he was invited to try his hand at a Sunday color strip for the flagship Morning World. 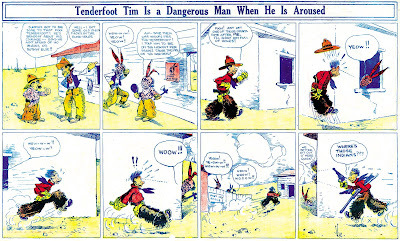 Apparently feeling a little homesick for his boyhood haunts in the deserts of eastern California, Vic came up with a strip about some namby-pamby Easterner named Tim who comes out west to live the cowboy life. He finds himself on a ranch with a pair of practical jokers who are determined to put him in his place. 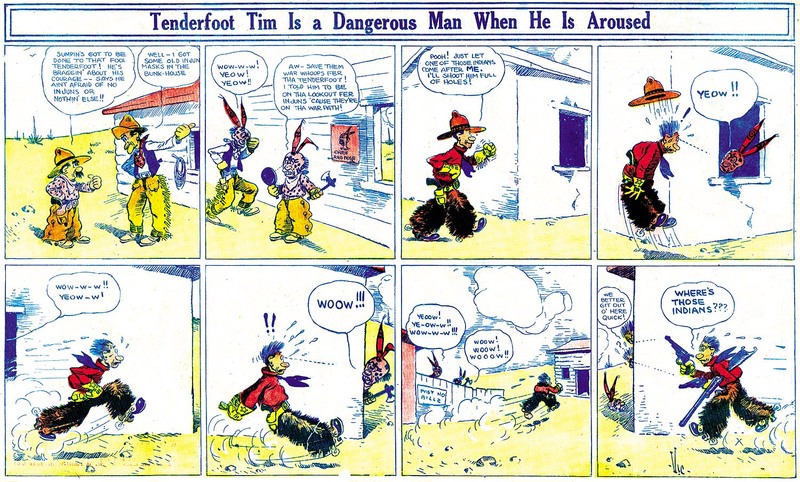 Surprisingly, a very democratically-minded Vic makes Tenderfoot Tim a worthy opponent for Wilde and Wooly, the two ranch-hands -- Tim often gets the upper hand in the strip and turns the tables on the prankster pair. I wonder how the home-folks felt about Vic being such a Benedict Arnold? The strip was apparently well-received, though it rarely if ever got full-page cover play in the Sunday World. It ran steadily from October 20 1912 to March 15 1914. Swinnerton and Norman Rockwell. He founded a fine art Gallery in California and is a noted Desert Painter. Well into the 1950's he was writing articles for Desert Magazine. In the early 60's Desert Magazine produced four fine prints of his Gold Rush series of painting, that show the same desert location over time from early Rush propectors arrival, through two paintings showing the rise of a bustling town, and finally in the final painting a deserted ghost town. A framed copy of the last one is hanging on the wall next to me as I write. I have pieced together my limited knowledge of the man over the last 5 years, but it has been a tough slog. I've only seen a few photo's, all from a late age. I think that I read on your site that he may have suffered from a breakdown, but it appears that he was very productive in the later parts of his life. Thanks again for the post. Henry Weston Taylor was born in Chester, Pennsylvania on May 11, 1881, according to his World War I and II draft cards. He was the oldest of three sons born to Barnard and Martha, as recorded in the 1900 U.S. Federal Census. They lived in Upland, Pennsylvania on Upland Avenue. His father was a professor. A family tree at Ancestry.com said Taylor married Emma Louise Pendleton in 1901. An entry in the American Art Annual, Volume 28 (1931) said he was a "pupil of [Henry] McCarter and [Thomas Pollock] Anshutz" at the Pennsylvania Academy of the Fine Arts. Who's Who in American Art, Volume 2 (1938) said he was a "pupil of McCarter and [Hugh] Breckenridge." Who's Who in American Art (1953) said he also studied at Drexel Institute, known today as Drexel University. In 1910 Taylor and his wife resided with her father, a widower and banker at a trust company. They lived in Upland at 2 Seminary Avenue. His occupation was an illustrator for periodicals. American Art Annual said he did "illustrations for the Saturday Evening Post, Red Book, Ladies' Home Journal, Elks Magazine, American Boy, MacLean's, etc." The Delaware County Daily Times (Chester, Pennsylvania) profiled Taylor on May 11, 1976. The article said he and Norman Rockwell "worked together at the Saturday Evening Post years ago." He signed his World War I draft card on September 12, 1918. He was a commercial magazine illustrator at 524 Walnut in Philadelphia, Pennsylvania. His description was tall and slender with blue eyes and black hair. Weston illustrated a number of books by Octavus Roy Cohen, including Come Seven (1919), Polished Ebony (1919) and Highly Colored (1921). The family, which included a daughter and son, remained at the same address in 1920. 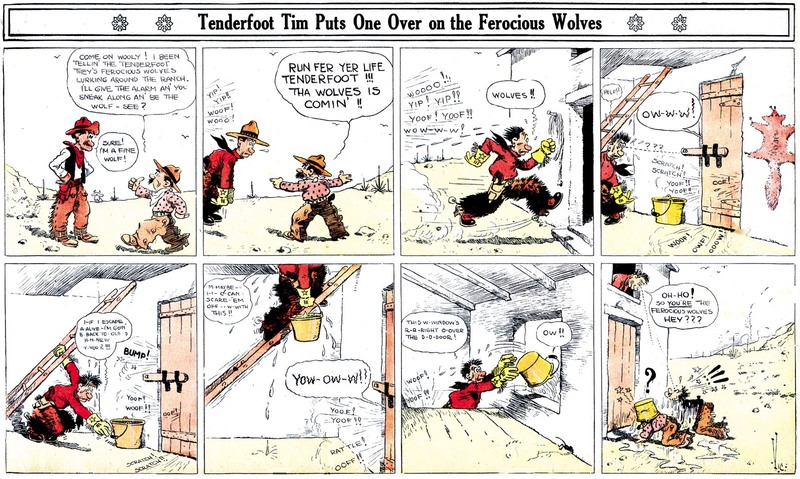 Taylor, an illustrator, drew the 1923 comic strip, Tempus Todd, which was written by Octavus Roy Cohen. The 1930 census recorded the Taylors at the same location where he continued as an illustrator. Who's Who of American Comic Books, 1928-1999 has a list of some of his comic book credits from 1939 to 1942. He signed his World War II draft card on April 27, 1942. His occupation was magazine illustrator. Excerpts from the Delaware County Daily Times profile of Taylor, on his 95th birthday. "That's one thing about my work," he explains. "I like to have every painting tell a story." It could be in the languid nudes of his "Clair de Lune" or it could be the impending battle between a moose and wolves in a blizzard. And there's one thing about Wes Taylor. Regardless of the increasing frailties of age, he's still full of life. He still paints five or six hours a day. It might take him a day or a week to complete a work but whatever the time, there's one thing certain. He's already got the next painting in mind." Taylor continued to paint until his passing on April 8, 1978, according to a family tree at Ancestry.com. I met Weston as a friend of my former in laws. "uncle Wes" and I became friends. His home was in front of the hospital for which I worked.He told me many stories of his youth including standing on his front porch watching the wagons bring the dead from the 1918 flu to the Chester Rural cemetary. He did a self portrait of himself for me in the 1970's.He loved to paint beautiful women including Deidra Hall and Norma Zimmer. He had a special affinity for the lot of the American Indians. Also, Uncle Wes designed the Chicklet box which is still used today. H. Weston Taylor,Sr, was my grandfather. I spent many family holidays at the 2 Seminary house, and have inherited a number of his artworks and family heirlooms. The only factual correction I can offer to the account above is the wedding date, which was in 1908. I have much of the wedding silver, given to the couple with this date inscribed on it. I am also the proud owner of his gold pocket watch, a fine piece that works perfectly today. He also illustrated the comic book series "Ace of Space". His son, my father, was a career US Air Force officer, and it appears that the Ace of Space was modeled after my father. He even looks like him! My aunt, Helena, the daughter of Weston, was an actress, working in television and film, and lived in Los Angeles.She often modeled for her dad, appearing in many of his magizine illustrations. He was a consumate gentleman, and a soft-spoken man who loved to go canoing for weeks in the Canadian wilderness, accompanied by only one Ojibwa guide, who became a lifelong friend. Much of his personal art, in watercolours, pencil, and charcoal, is in my collection, and is from his many trips to Canada. He was a loving, funny, and very intelligent man. I miss him and wish my own kids could have met him. Your grandfather was friends with my parents. I believe they met through Upland Baptist Church. I grew up in Upland. My parents were much younger than Wes so I was a young child when I knew him. He was fascinating to me and I loved visiting his house with all the walls covered with paintings. I can still see in my mind his paintings of wilderness with natives, wildlife, and canoes. Your aunt came to our house for a holiday dinner once. She was larger than life to me. Wes painted a portrait of my mother. He loved her blue eyes. My father did a lot of the maintenance on Weston's home. that's how i met him. he taught me how to shoot my bow. when i was in high school in the late 60's i would stop in to see him on my way home. about 4:00 he would be finishing up talking to his brother in law [i think] on the ham radio. then we would talk. [a couple times a month]i would love to talk to you some time. thanks Don Jaggers P.S. i have 5 of his works that he made for me. 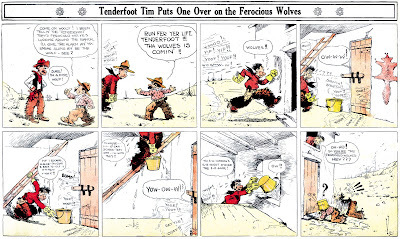 Tempus Todd didn't last long and it sure didn't run in many papers, but it does mark a rather important milestone in the history of newspaper comic strips, even if it's lead wasn't really followed for, oh, about 60-some years after its appearance in 1923. It is the first comic strip for mainstream (read 'white') newspapers that treated black characters as more than caricatured buffoons, half-wits and layabouts. Although the characters in Tempus Todd do speak in stereotypical dialect, they are most definitely written as 'real people'. They are also not drawn in the standard balloon-lipped inky-faced stereotype. The basic idea is that Tempus, the lead, is a cab driver. At first the gags are mainly about his fares, but as you can see from the samples above he soon gets into more involved plots. Unfortunately the strip didn't have long to mature. It only ran (as best as can be determined), from April 16 to September 29 1923. The strip was written by Octavus Roy Cohen, who had good name recognition in the twenties because he was a regular contributor to the Saturday Evening Post, specializing in tales of black folk. The art was handled by H. Weston Taylor. Taylor was a prolific book illustrator in the teens and twenties, including several of Cohen's novels. He also pops up much later as a comic book artist, but this is his only known newspaper comics credit. The daily grind of newspaper work doesn't seem to have suited him well. At first his art on the feature is sort of a bargain basement version of E.W. Kemble, but the quality varies widely. Later in the run Taylor seems to really be dashing the stuff out -- the art gets pretty darn basic near the end. The syndication of Tempus Todd is a bit mysterious. At first the John F. Dille Company is credited, but by September, at least in the Oakland Tribune, there is a credit outside the strip to the McClure Syndicate. On such a short run feature a syndicate change seems rather unusual, and I wonder if the Tribune credit is a mistake. Thanks to Cole Johnson for the sample images! 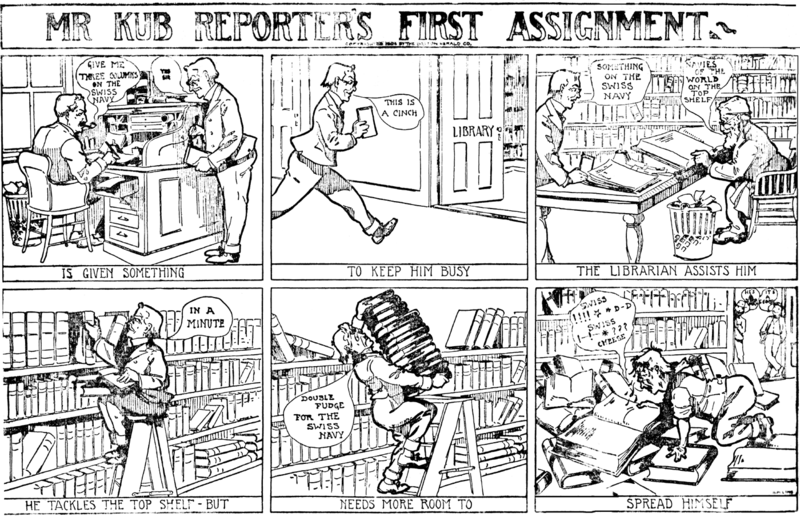 A fellow named Rollins, who didn't bother to sign his first name and never did another series, contributed Mr. Kub Reporter to the pages of the Boston Herald's comic section for a whole four weeks, March 20 to April 10 1904. Here he recounts the classic prank played on young newspaper reporters. Perhaps Mr. Rollins himself, as an artist, was never a victim, but you can bet he saw this stunt pulled in the newsroom.